I had to get out of the city, so we took a little road trip to Kailua. Locals say Kailua is on the "other side" of the island. In actuality, it's a 20-25 minute drive from Honolulu. It's up over the Koolau Mountain range and the Pali and down into Kailua Bay. My coffee addiction led us to the General Market there. The cashier peered at me over the register and said, "Hawaii Five-0 is filming at the beach." My eyes grew big. The coffee trembled in my hand. I turned to Mark who looked just as excited as I. The cashier continued,"The eye candy is there, too." She looked directly at me, not at Mark. We raced to the beach to find Alex O'Laughlin and Scott Caan and their stunt doubles on the beach. 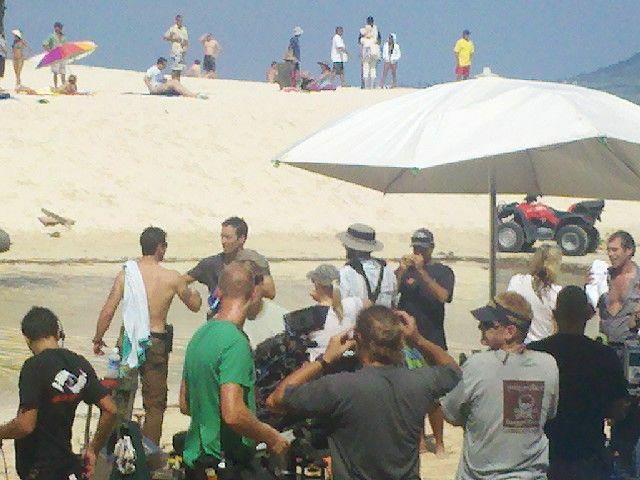 In one photo Alex O'Loughlin and his stunt double are running into the ocean at the end of filming. Scott Caan is reaching into a cooler to get water....for his dog! The background extras were all hired actors, not like when Mark's grandpa was asked at the time of filming to be an extra in the original show. Even Dot got into the action, she was behind Alex and his stunt double. Is Dot Scott Caan's dog? Cool pics. :-) Were these shot in mid- to late February? Just trying to place them in the production timeline -- they look like this was one of the Kailua Beach filming days for the most recently aired episode. (Scott on ATV, Alex running down beach, stunt double tackles guy in tidal pool, swaps out with Alex, etc). Thanks bhayling. Glad you liked them. This was mid-February and it was the episode which aired last week. We had fun watching them.